With Kristaps Porzingis sidelined due to his ankle injury, the Knicks couldn’t rely on Tim Hardaway Jr. either. Just minutes prior to the game, the mysterious absence of Hardaway was announced, so coach Jeff Hornacek started with Michael Beasley and Damyean Dotson. The Knicks trailed by as many as 17 in the first quarter but recovered in the second and in the leading minutes of the third they got back in the lead. However, a 10-0 run by the Magic late in the fourth was too much for New York, and Orlando prevailed, 105-100. Beasley led the Knicks with a season-high 21 points, shooting 52% from the field and was followed by Courtney Lee who ended up with 19 buckets. 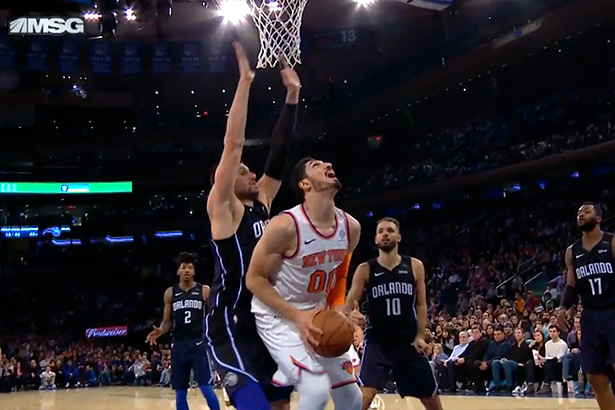 Enes Kanter was in double double with 18 points and 16 rebounds while, off the bench, Lance Thomas was the only other Knick that finished in double figures, with 11 points. From the other side, Nikola Vucevic scored a game high 34 points, including eight straight in Magic’s fourth quarter run, Evan Fournier had 20 and Jonahon Simmons contributed with 16. The Knicks, who dropped to 11-11, are winless without Porzingis and they will miss both him and Hardaway tonight in Indiana.